Does the national debt ever need to be repaid? 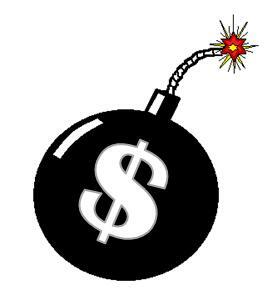 Does the national debt, now at $18.15 trillion, ever need to repaid? It seems an important question since, as far as the record is concerned, it has increased every single year since 1957 — more than 50 years ago. Except for brief periods in the 1950s, the 1920s, the 1880s, after the First Seminole War when the debt was reduced until Andrew Jackson nearly paid it off in 1835, and the early 1800s, it has pretty much always grown on a nominal basis. Since the end of World War II, it has grown an average of 6.5 percent a year like clockwork. Yet, we are told it is actually not that big of a deal. It started out in 1945 at 113 percent of the Gross Domestic Product. It dropped as a percent of the economy afterward until it bottomed in 1981 at 31 percent, and then began rising again rapidly. Today it is at 103 percent. Most of that rise has occurred in the last 10 years alone. But, perhaps it does not matter. Take former Director of the National Economic Council under President Barack Obama, Lawrence Summers, writing on the Brookings Institution blog. In it, he looks at today’s low interest rate environment and supposes this is actually the best time to be expanding the national debt. Further, in delivering the 2014 keynote address to the National Association for Business Economics, Summers cited the “declining rate of population growth” that coincides with collapsing interest rates, along with a “labor force [that] will grow at a substantially lower rate over the next two decades as it has over the last two decades.” Summers says this will create a demand gap in the economy. And, of course, the government should fill that void on the fiscal side. In Summers’ hypothetical, as long as interest rates are zero percent, no amount of debt accumulation could be too large, because the principal on the debt does not need to be paid. Only the interest. And at zero percent, there would be none, so, problem solved. Right? Of course, interest rates on government debt are not zero percent. Not yet, anyway. But they have been collapsing for over 30 years. Today, 10-year treasuries go for about 1.85 percent. How low can rates go? Just ask Japan. Their 10-year treasuries got as low as 0.20 percent earlier this year. Yet, the European sovereign debt crisis teaches us that rates can rise quite suddenly even with aging populations and a slower growth of labor markets. There, demand for treasuries collapsed suddenly in Greece, Italy, Spain, Portugal, and Ireland. That might warn against taking on obscene levels of national debt. Consider, for every percentage point interest rates rise, the government will owe $180 billion in interest payments over the long haul as the new rate gets baked into the cake. Just because rates have been dropping for so long is no reason at all to throw caution into the wind. Our fiscal problems are quite real, and are not to be taken lightly, particularly if rates really do begin rising. 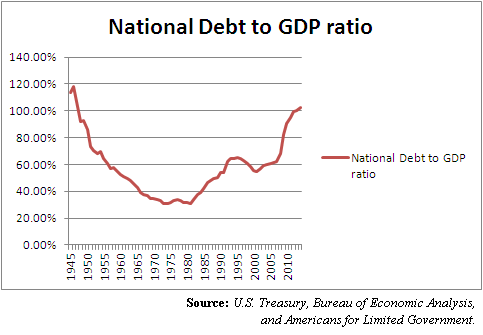 Therefore, as long as there is a robust market for U.S. treasuries, no, the national debt does not need to be repaid. But, if demand for U.S. debt collapses, as happened in Europe, and interest rates rise rapidly, the consequences could be catastrophic. Then, we would not be able to refinance the debt, let alone repay it.